East Tennessee State has played a number of close games this year, but each time the game has been close, the Buccaneers have come out with the win. Their lone loss on the season was against FBS Tennessee. The Buccaneers are on a 5 give winning streak following the loss with three wins of three points and a two point win also included. The Buccaneers will not be intimidated to play in a tight contest this week against Wofford. 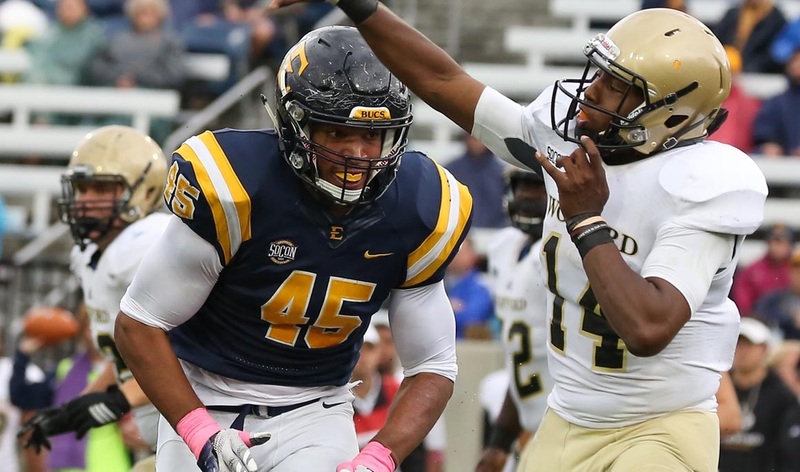 Quay Holmes has led the way on offense for East Tennessee State. The redshirt freshman running back leads the team with 496 yards on the ground and 8 touchdowns. In the passing game, there is not one specific receiver to key on. The Buccaneers have six receivers with at least ten catches, but no receiver with more than 21 receptions. Key Player: LB Dylan Weigel leads the Buccaneers in tackles (59) and tackles for loss (10.5) on the season. Against a Wofford team that you know is going to run the ball most of the time, gap control is very important for a defense. THat means the linebackers must maintain their assignments and not get out of place. Weigel is the leader on defense and will be tasked with bottling up the Wofford triple option game. Theres no doubt that the Terriers will break some plays, but the Buccaneers have to limit those big plays on defense. Fantasy Bonus Baby: RB Quay Holmes has carried the load on the ground for the Buccaneers. Holmes has half of the carries so far this season and is just shy of 500 yards. His best game in Southern Conference play was against Furman when he got 22 carries. Holmes picked up 102 yards and two touchdowns on those 22 totes in the game. Holmes is also the second leading receiver for the Buccaneer with 19 catches for 161 yards and a touchdown. As a freshman, Holmes will do nothing but improve with each game of experience. Holmes will easily eclipse the 100 yard all purpose mark and could flirt with 150 all purpose yards. You can also expect him to find the end zone at least once. Wofford runs the triple option offense and dares opposing teams to stop it. For the most part this season, the Terriers have controlled the game with their run game. Wofford averages 365 yards per game on the ground, using a number of different runners to get there. The Terriers have six ball carriers with at least 13 carries this year, and all of them average at least 5.5 yards per carry. As a team, Wofford averages 7.1 yards per carry. On defense, the Terriers only give up three yards per carry and 93.5 yards per game. The Terriers dropped their first FCS game of the season last week in a 20 point loss against rival Furman. Earlier in the season, Wofford went up to FBS Wyoming and came within a few seconds of pulling a huge upset. The Terriers will be looking to get back on track in what has become the Southern Conference game of the year. Key Player: QB Joe Newman is the triggerman in the Wofford offense. While he has only thrown 68 passes so far this year, he has completed just under 65% of those passes including five touchdowns. When a team runs the triple option, the pass can be a dangerous weapon because the opponent is always keying on the run game. The Terriers average 11.8 yards per catch in the pass game. Newman himself has kept the ball on a carry 62 times for 341 yards and three touchdowns. His ability to read a defense and make the right play is critical in the Wofford offensive scheme. Fantasy Bonus Baby: In an option offense, always look toward the top running back for daily fantasy picks. In the case of Wofford, that is RB Andre Stoddard. So far this year, Stoddard has carried the ball 84 times for 548 yards (6.5 per carry) and added five touchdowns. On a quarter of the plays, the ball is in Stoddard’s hands. He should easily gain over 100 yards and score a touchdown in this weekend’s game. Fearless Prediction: This game is the most important one of the year in determining the Southern Conference champion. East Tennessee State has not lost in conference and has played multiple tight games so far this year. Wofford tripped up last week against a rival and will come into this game looking to reassert themselves as the top team in the conference. This game will be close for three quarters, but the Terriers look to be the better team overall. Wofford 33, East Tennessee State 20.